You probably have had the experience driving through the woods in the dark when a deer was crossing the road. Rather than getting the heck out of there, it freezes in the middle of the road and stares at the light. It is immobilized because of what it thinks might happen. Luckily I have always been able to stop, turn off the light and let the deer slowly scamper off to the safety of the forest. Something like it is happening in the real estate market. Times are so unusual right now that many people are like the deer in the headlight, unsure of how to move forward. But times like these provide the perfect opportunity to buy a nice home. There is more housing inventory on the market. There are more houses to buy. 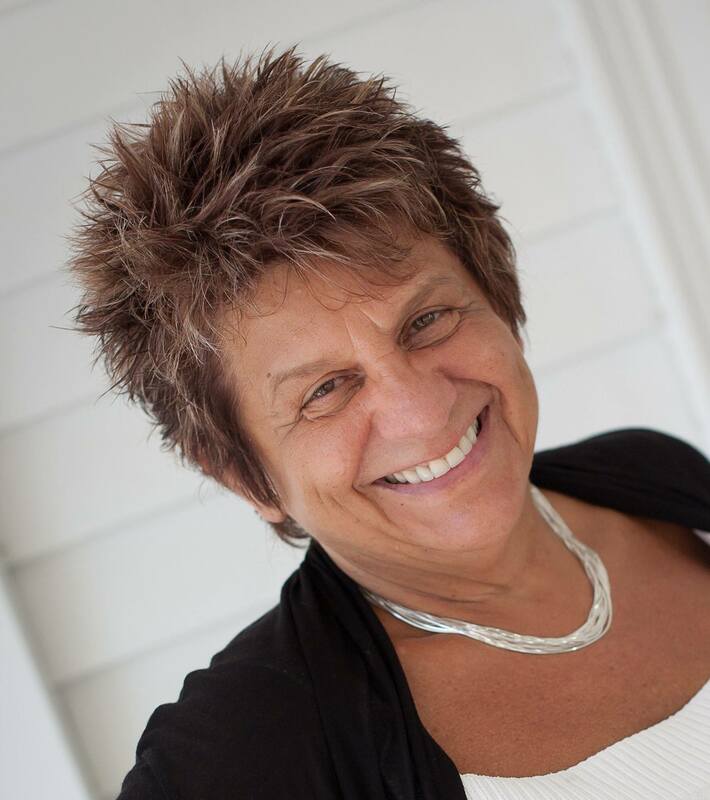 Sellers are working with Buyers to create win-win purchasing situations. Interest rates are low. Inspectors have time. Realtors have patience. I wish I had gone ahead when the market was slow. We can’t call the top and the bottom of any market. But every time the waters are swirling it is easier to catch the fish☺. If you want to buy a home, now is a great time. It has opened up the world to me. I have friends all over. The people on Facebook provide news that the main stream media often does not report. There are perspectives from all different kinds of people about interesting subjects and breakthroughs. And it is hilarious to follow rants that people in real life would never say to each other. Just to achieve this kind of communication between millions of people is impressive in itself. Now Zuckerberg is part of a satellite launching so that unconnected residents of Africa can participate. That is cool. He had a meeting with the pope discussing how to use communication technology to help alleviate poverty on the planet. Who knows. We might achieve a breakthrough around poverty in the world with communication. And we have gotten lots of money for the San Francisco General Hospital. All good. And he moved to my neighborhood. Where is the real estate market going to go? Up, down, sideways? Sideways it is for now. But stand on my shoulders on this. In my 28 years in the real estate business I have never seen anyone guessing the top and the bottom accurately. I bought my home in 1994. Nobody knew it was the bottom. Times were tough with no end in sight. I bought the property I could with the money and qualifications I had. 22 years later I look like a genius. But that’s not how it goes in real life. The best way is to buy a home at the time you can afford it for the price you can afford and the money the bank will lend you. you can be as creative, loving and self-expressed as possible. For me homeownership is freedom. It is between you and the bank unless you are lucky enough to pay cash. Pay your mortgage, your property taxes and your insurance and enjoy life the way you want without worrying about circumstances that might come up in a rental beyond your control. It is fun to own your own place and it is empowering. 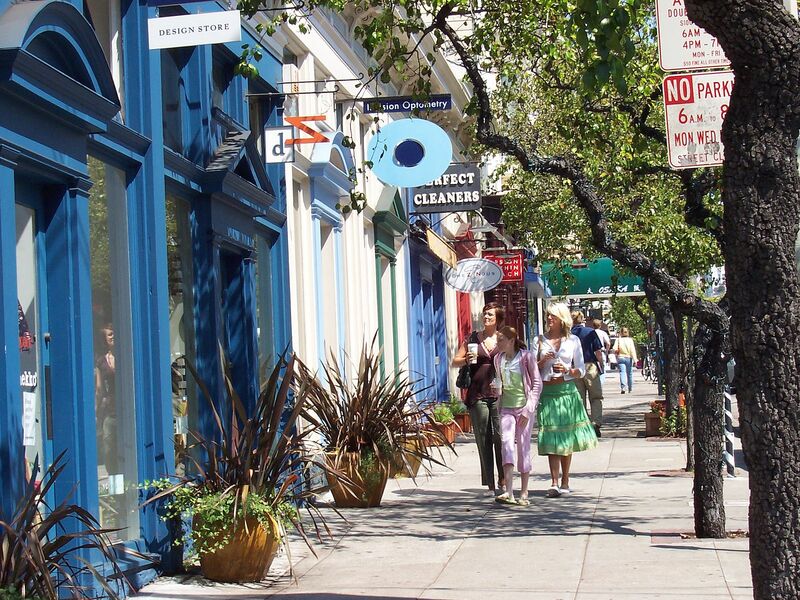 San Francisco has great neighborhood shopping streets in addition to the malls and Union Square. There are shops for every taste and inclination. Hayes Valley is thriving with lots of stylish little unique clothing and shoe boutiques, bustling restaurants and cafes and not to forget, Blue Bottle where you can enjoy your freshly brewed while hanging out with your friends. 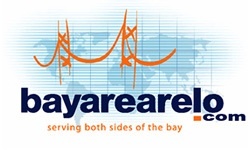 Hayes Valley is one of the more recent additions to our neighborhood social scenes. The Octavia Street corridor is always busy with people enjoying the outdoors. 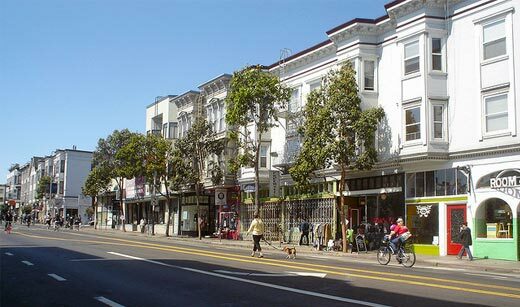 Valencia Street is a favorite shopping street where goth is vying with cute hipster clothing, jewelry and trendy furniture, art galleries cafes, bookstores, bars and ethnic restaurants. The restaurant scene is slowly pushing its way to Mission Street where there are already wildly popular eateries and further down even a bowling alley and live music venues. Upper Fillmore is an upscale shopping street where Liz Claiborne is a popular store next to Athleta and other brand-name clothing lines. 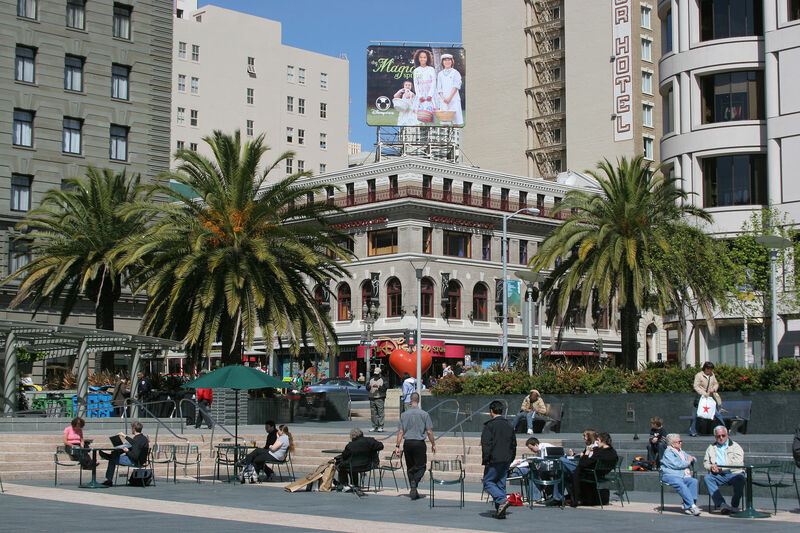 There is Starbucks, Peets and several great restaurants as well as high-end consignment stores, a neighborhood movie theatre and a veterinary clinic. 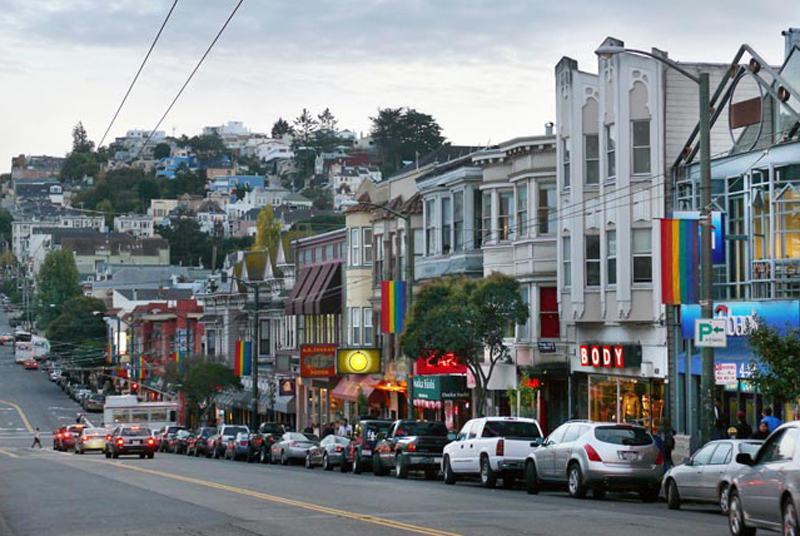 Upper Haight Street has the hippie and hard rock clothing stores interspersed with a couple of chain stores, Goodwill and Whole Foods, music stores and other items not found anywhere else. There are casual restaurants with a café here and there. 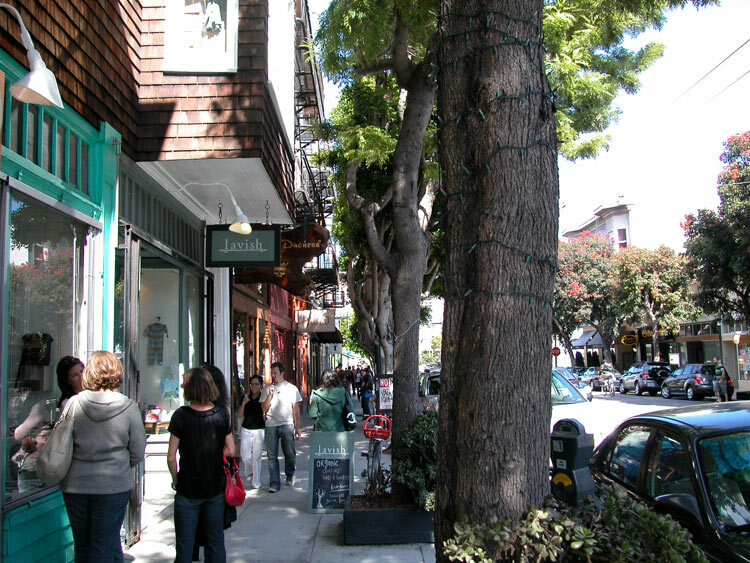 Union Street, the high end Pacific Heights shopping street extends also along Fillmore Street down to Chestnut Street. There are popular restaurants at the high price point, a variety of different stores with work-out clothes, leather jackets, business and business casual outfits and bedding. There is a health food store, several hair salons and spas, Starbucks and a yogurt place. 24th Street in Noe Valley has several children’s clothing/toy stores reflecting the many young couples with children who live in the neighborhood. There is a Whole Foods store, some restaurants, a bagel place and a few small eclectic storefronts. It is a neighborhood gathering place that even has a Farmer’s Market and a small 24 hour fitness club. Castro and 18th caters to a large gay men’s population. There are some fashionable men’s clothing stores, several banks and busy bars and restaurants with a lively nightlife. Walgreens and a hardware store are anchor tenants and Mollie Stone feeds many. 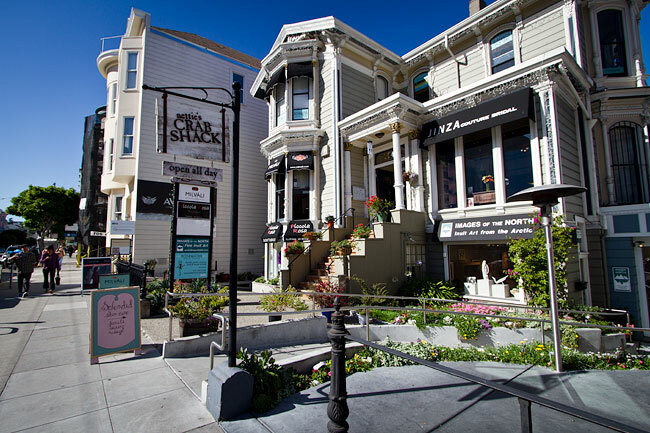 The restaurants, bars and cute stores also wind down Market Street with several fitness clubs and stores not to be found in other parts of town. 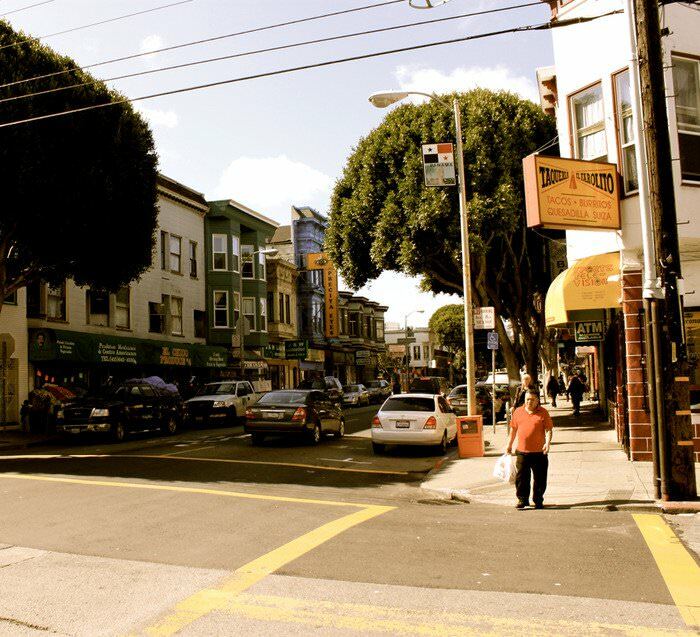 24th Street in the Mission is in a transition where mom and pop bakeries, grocery stores and taco places still remind of the old Mission before it became trendy. Cortland Avenue has a nice health food store, some restaurants and local bars and little stores as well as a couple of popular cafes. 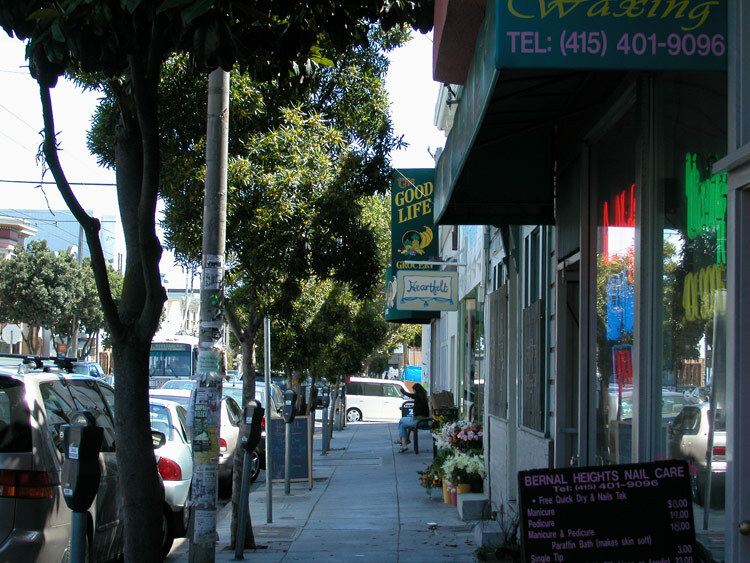 The library and a church as well as a neighborhood center are in the center of the street which like Bernal Heights has retained its close-knit neighborhood character. Opinions are all over the place about Facebook, Twitter and all the other social media opportunities for people to be in contact with each other. It is the best of times for those of us who want to stay in touch with loved ones all over. And it is a privilege to meet people all over the globe. We can exchange ideas, inform each other, be friends across cultural, national, ethnic and all other differences. We can find communalities, communicate honestly and learn what is going on for people without the filter of news reporting and its different slants. And we can make a difference and give each other strength. We can help each other to grow beyond what we know in our own backyards. It fosters tolerance, understanding and an appreciation of the humanity of all of us, ideally. But at least it gives us the possibility to be informed about other people and places. Where else can a libertarian and a liberal actually exchange ideas? Even though they might not agree but at least they are communicating. Or a Nigerian blogger can be heard about his government. Posts about travelers to Nepal and a teacher in China can open our eyes to what it is like there for regular people without the sensationalism. It is the best tool available for us humans to be connected on a big scale and still be able to be in touch with each other as individuals.